Choosing a lens for wedding photography. There's a motor vehicle workshop in town that has this sign on the wall. Basically if you want your car fixed you can only choose one of these options. You can't have a cheap, fast and quality repair - one choice excludes the others. It's similar with lenses. In the case of lenses however a fast lens is generally a quality lens so we need to change the wording a little. In other words it is impossible to get a cheap 28-300mm equivalent f1.4 lens to cover every situation at a wedding. As you can see [in my opinion] the Tamron 17-50mm f2.8 hits the sweet spot in price, versatility and light transmission. [I don't mention the Sigma which is better built because its zoom action is in the reverse direction of Nikon lenses, it's still a good choice if you can get used to that. The Sigma 18-35mm is an amazing option for those who can live with its limited range - someone used to shooting primes only will find that this is a dream lens, like 3 - 4 primes in one lens - if you like the 35mm [50mm equivalent] prime then with the Sigma 18-35mm you have the option of going wide if needed and I think it is a very sensible choice. Last weekend I shot a friends wedding, they are from the Phillipines and those people love their group shots. If I wasn't shooting my 18-140mm lens I would have been in trouble with the various requests "Take a picture of us" and it starts off with me moving the lens to 35mm, more people get added in, 24mm, more people get dragged into the shot and then I'm at 18mm and dragging out a chair to stand on from the other side of a table to get everyone in. My point is: The ultimate quality prime lens can still become useless in some situations. Are you going to tell the couple "I only shoot primes and I didn't have time to change lenses, but the 4 of you in the middle will be really sharp! ", or "The 50mm 1.4 is so much sharper than the 24mm so I didn't bother getting a 24mm, actually the 35mm is also very sharp so I can fit 8 of you into the picture!." But what about lens sharpness, distortion, colour, contrast - all those terms you read about in the reviews? Besides the fact that all of these things can be adjusted when you process your images, and modern cameras automatically correct for a lot of these imperfections anyway, can you honestly tell the difference in an image you see that isn't a side-by side comparison at 100%? I know that if you squint your eyes, tilt your head to the left and twist your tongue against the roof of your mouth you can actually see a difference but will your customers see this difference?Are you afraid to let other [armchair] photographers know that you are not shooting with a prime lens? Is the following image sharp enough for your needs? When I took it I owned an 18-105mm kit lens, a 70-200mm f2.8VR, a 50mm f1.8D and an 85mm f1.8D. What lens do you think I used? It was taken with the 18-105mm kit lens on a 12 megapixel Nikon D90 and is a 6 megapixel crop from half of the image [resized to 2500 wide for this blog]. What makes it sharper than the average photo is that the flash was set at 1/128th power which fires in 1/41600th sec so there is almost no movement in the image - technique is so much more important than lens sharpness. On dxomark the 18-105mm yields 7 actual megapixels of sharpness on a 12meg dx sensor so with a 50% crop you're looking at about 3 megapixels of sharpness. It would look good on a billboard viewed from the correct distance - and please don't tell me "now zoom in to 100%" - what would the point be of pushing your nose up against a billboard to prove there are imperfections to people driving past who will never see those imperfections? As we go through these various points please think carefully about your choices and ask yourself the question: "If it were my wedding how would I like it to be done?" 1.) 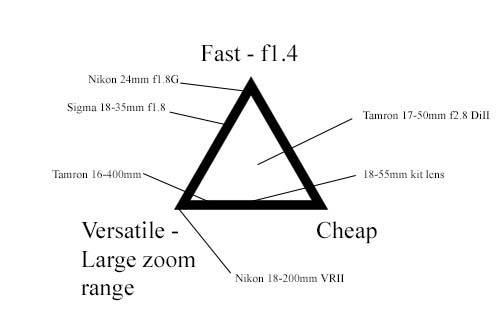 You can take an f1.4 lens to f4 but you can't take an f4 lens to f1.4 But: you can blur the background later in an image taken at f4 but you can't recover detail from the background in an image taken at f1.4. My point? If you're shooting with an f1.4 prime use the aperture wisely "just because you have the tools doesn't mean you have to use them" you don't use your new flash when the natural light is perfect and you don't shoot everything at f1.4 to blur the background beyond recognition just because other photographers say "Ooooh what creamy bokeh, it looks so professional!" - until your customer says "Why is the background so blurry? My cellphone takes better pictures!" because Uncle Bob is smiling for the first time in years but his face is out of focus behind the couple so they wonder what is wrong with your camera [this is the wedding where uncle Bob's only camera is in for repairs so he didn't shoot the wedding for them]. Blurred backgrounds can look very professional but your main focus should be capturing memories for the customer, that is why most of them think they are employing your services, not to impress your photographer friends. What's important to your customers will differ greatly to what other photographers appreciate in an image and if there is something or someone important in the background it is safer to shoot at a smaller aperture to get it in focus. Just don't show your photographer friends the images or they will tell you that you need to 'separate the subject from the background' more [the background that your customer wants to see that is]. Nikon 18-200mm - I was shooting at 200mm but zoomed back to show the scene and ended up preferring this image. 2.) You can crop more with a sharp prime than with a zoom but you can't zoom with a prime. Sounds obvious but you will come up against these arguments. So how much difference does this make? Well the Nikon 24mm f1.8G is one of the sharpest primes out there and on dxomark it yields 15 megapixels of actual sharpness on a 24 meg dx sensor. And the 18-140mm 'kit' lens? 11 megapixels of actual resolution which is nearly 4X that of the sample image I posted of the bulb being smashed! So with the 24mm prime I can crop 1.36X [32.7mm]to get to the same resolution of the 'kit' lens at that focal length. But the 'kit' lens can go all the way back to 18mm and out to 140mm. However when you crop you are also magnifying any movement in an image - as when you zoom of course - but the 'kit' lens has VR [vibration reduction] while no 1.4 or 1.8 prime has it. At 140mm and 11 megapixels resolution the kit lens will have far superior image quality to the 24mm cropped in to that size at 2.5 megapixels. Of course anyone shooting weddings must have at least two camera bodies with perhaps a 24mm on one [35mm equivalent] and maybe a 50 or 85mm on the other and there is no reason why you couldn't get really good images from that combination - just be prepared for the fact that your widest lens is your critical limit - a 2.5 meg crop will still look fine with a quality lens, you can crop in but you can't 'crop out' wider. Nikon 18-200mm, wireless sound trigger for the flash plus a pellet from an air rifle. 3.) You don't see the images a photographer missed. At the end of the day when people are going "Ooooh" and "Aaaah" at the amazing portraits produced with creamy bokeh you are seeing the best images they were "able to" capture, obviously not the ones they weren't able to capture. I once read a comment from an amateur regarding what they would do if they were to shoot a wedding, "I would take my sharpest lens, currently a 50mm f1.8D and discipline myself to take all the pictures with that lens!". Seriously? a 75mm equivalent for every wedding photo? Just because that lens would give 13 meg actual resolution over the 11 of the 'kit' lens. That would mean getting 4 people in the middle of a 12 person group shot at the reception in the case of the last wedding I shot, unless of course you were planning on doing a pano and stitching later which I think some people are 'dedicated' enough to attempt in their quest for 'ultimate quality' to impress their photography mates. Good thing he didn't get to shoot a wedding when he owned the 200mm f2 lens, it would have been his sharpest lens and it would take a lot of discipline to shoot an entire wedding at 300mm equivalent simply to get ultimate sharpness. So now we come to the "mid range zoom". 24-70mm f2.8 on full frame, 17-50mm f2.8 on a crop sensor and perhaps we could include the 16-80mm f2.8-4 Nikon and the 18-35mm f1.8 Sigma lens. Some people use a Tamron 28-75mm f2.8 on a crop body but I find the 28mm wide end a little limiting. For those who insist "Primes are still sharper than f2.8 zooms" give it a break, nobody will see the difference. Have a look at Zhuoya photography, one of the best in New Zealand. Most of the images in his gallery are taken with the Nikon 24-70mm [full frame] please contact him and let him know where he is lacking if his images don't meet with the quality standards for wedding photography. Occasionally 24-70mm f2.8 plus 85mm "because the 70-200mm is a heavy beast to carry all day"
Sometimes followed by "I've been shooting primes but am going back to a 24-70mm f2.8 because I'm missing too many shots changing lenses" [As I said, we don't see the shots a photographer missed]. Also occasionally "The 35mm is sometimes a little limiting so I'm thinking of going to a wider prime"
Nikon 18-200mm. I had this shot in mind but didn't know what focal length I would need - the 18-200mm allowed me to choose at the time. Another option is the very good 18-140mm 'kit' lens to cover all situations plus maybe the 50mm 1.8G for some 'bokeh' portrait shots during the day and the 18-35mm 1.8 Sigma in the bag for when the light levels start dropping. If it was your wedding being photographed what would you want, primes with ultimate quality or zooms that get everything in? The Sigma 35mm f1.4 yields an amazing 16 meg resolution on a 24meg crop sensor while the Nikon 24-70mm f2.8 is two stops slower and 'only' yields 12 meg resolution. All those numbers to get your head spinning and sway you towards "ultimate image quality" rather than "ultimate versatility". Which would you rather have and more importantly which would your customer rather have? With a 35mm or 50mm top quality f1.4 prime you can get resolution and background blur not possible with the 24-70mm. But then you can't zoom back and get in the 12 people lined up asking for a group shot in the reception hall, this part isn't my opinion, it's fact. Let's look at the 2X crop from my 12 meg D90 and the 18-105mm kit lens giving around 3 megapixels of actual resolution. Is the resolution critical to your decision when this is what a kit lens can accomplish? If not then all that's left is background blur vs versatility for you to decide. I’ve added a very interesting video below.